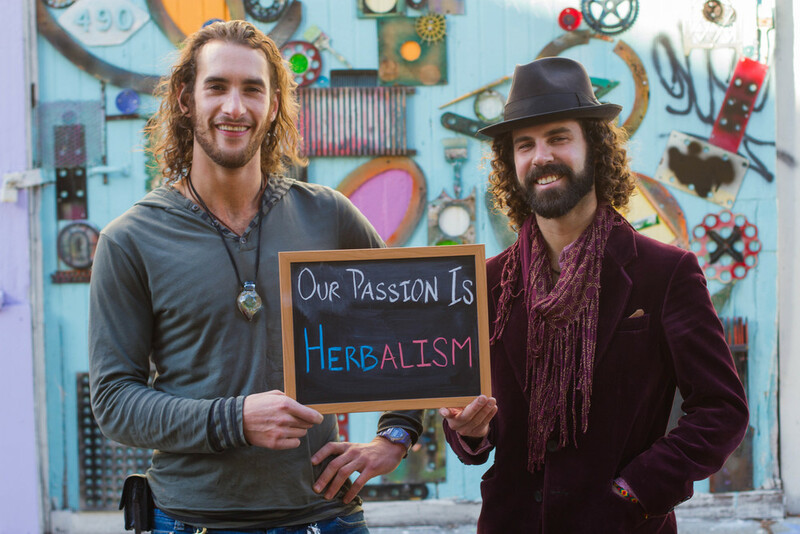 This story is part of the Special Edition series by Souls of San Francisco for The Passion Co.
What inspired Brilliant Elixirs? How did you two connect and come up with the idea? Michael: I love enjoying social beverages and periodically take breaks from drinking alcohol, but still desire to feel that warm social openness it can give. I started making an early version of “MoonShine” two years ago with the help of a master herbalist and I was sold from then on! It was really rewarding to serve these early versions to friends at events and see them have such a good time. Making them on a larger scale was a clear next step. Brandon: I missed the social drinking experience after developing pancreatitis and having to give up alcohol. One exhausted Sunday evening, Michael gave me a concoction that he had developed with a herbalist named Juris Ahn. I found myself feeling fantastic and dancing all night. I walked up to Michael after the party and informed him that we were starting a business! What were you doing before Brilliant Elixirs? Brandon: I had recently graduated with a Sustainable Business degree from Presidio, and I was hired as the CEO of Awakening360, a health and wellness web network and marketing platform. While rewarding, it wasn’t until forming Brilliant Elixirs that I realized I’d found my calling. Michael: I was engaged in event production as well as the hospitality industry. How do you go about making the drinks? Michael: All of our beverages are crafted, brewed and bottled by hand. Each Elixir is made fresh weekly, allowing us to constantly refine and improve our recipes and techniques. Our recipes are water-based decoctions combined with various herbal extracts and fruit juices. What are some of the challenges of being entrepreneurs and what motivates you to keep going? Brandon: The biggest challenge for Brilliant Elixirs is education. Most people don’t know that a healthy social beverage exists as an alternative to alcohol, or are reluctant to try something new. Michael: We’re also running into the challenge of being able to produce enough elixirs to satisfy all of our weekly orders and events - which is a good sign in the end, it means people are catching on! Brandon: To take Brilliant to the next level, we will need to hire employees, acquire advanced beverage production equipment and, of course, pay for these improvements. Michael: All of our Elixirs are handcrafted, which can be a long and gruelling process, but each time we arrive to an event with our beverages in hand, we fall in love with the project all over again. People are blown away by the effectiveness of our drinks, and keep coming back for more - that's all the motivation we need! What does the future hold for Brilliant Elixirs? Michael: On a production level, we’ll be investing in new, high-tech methods of extracting effective alkaloids from our plants, as well as further refining our Elixirs’ potency and flavor profiles. Brandon: We plan to be stocked on shelves in carefully selected venues, as well as to scale our operation up in size to accommodate our heightened demand. We’ll be seeking investors connected in the beverage or distribution industries who really feel a passion for our mission: to take social drinking beyond booze with organic, botanical beverages that produce delightful sensations without alcohol. Photos and story by Souls of San Francisco.